Magento Configurable Product Table Ordering Extension allows displaying attributes of configurable products in a more simple table to help customers add multiple simple items to cart at once. - Advanced edition: Pro Configurable Product Grid Table View. - Better Display for Configurable Products with only 2 attributes: Magento Configurable Product Matrix View. If you want to set a minimum quantity of configurable product, you can download Magento Minimum Quantity of Configurable Product extension here. 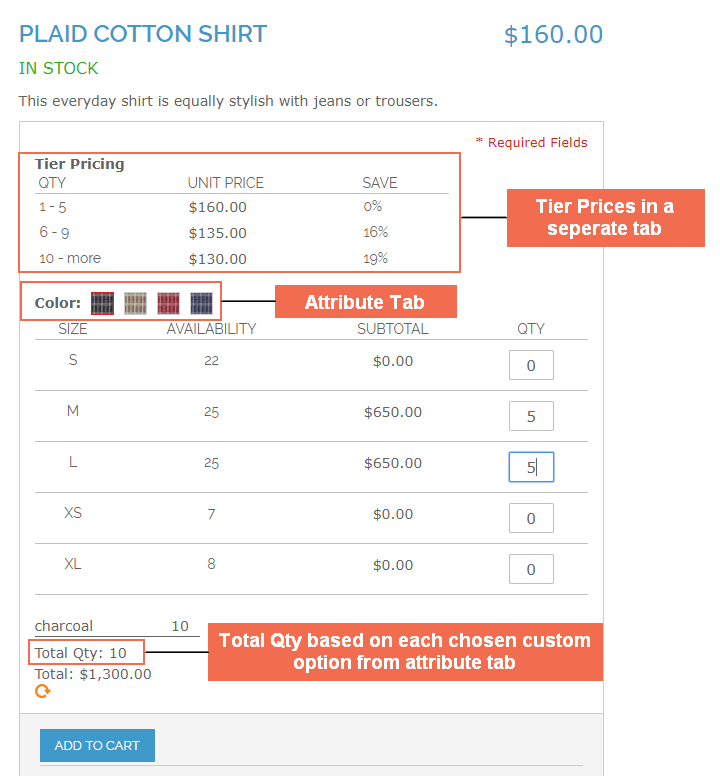 Calculate total quantity of products based on each chosen custom option in the attribute tab. + Normal Tier Prices: Tier prices are shown in the table view when children products have different tier prices or at least a children product has different tier price from other ones. For example, tier price of buying 1-9 Pink-M shirts and 1-9Pink-L shirts is similarly $210. Tier price of buying 10-more Pink-M shirts and 10-more Pink-L shirts is $200. Therefore, when you buy 5 Pink-M shirts and 5 Pink-L shirts, tier price is now determined as $200/shirt (Tier price of buying 10-more Pink-M shirts and 10-more Pink –L shirt). The total amount is now $2,000. + If you choose No, Magento default Tier Pricing function will be used to calculate. It means that total amount is calculated by tier prices of each children product multiply to total quantity of each chosen children products. Why is Magento Configurable Product Table Ordering extension your must-have extension? Compared to other kinds of displaying configurable products such as Matrix, Grid view or dropdowns in Magento default, Magento Configurable Product Table Ordering reduces the number of children products displayed in the table and helps customers choose products faster without much confusion and mistakes. Therefore, Magento stores can bring better shopping experience for customers by simplifying the process of selecting products and leads to increase sales. Magento Configurable Product Table Ordering extension is really one of the best choices for wholesale business because it allows customers to choose many items at once without taking much time to buy one by one as before. Customers can add as many as items they want to cart and do not have to repeat this process for times, especially then they can add multiple products to cart at once. This brings a larger amount of revenue as well as enhance wholesale business to develop. Therefore, it is one of the most important features that Magento stores can satisfy wholesale customers is providing a quicker ordering or in the other hand, they can purchase in bulk by filling wanted quantities for each children product. Administrators can easily configure settings with availably detailed instructions in Magento backend. Magento Configurable Product Table Ordering is developed by our certificate developers who ensure that it’s well-compatible with default Magento and hardly find any conflicts. Great product and service. Would buy again. We sell photo frames. Each frame has multiple sizes. Each size has a different tier-price structure. 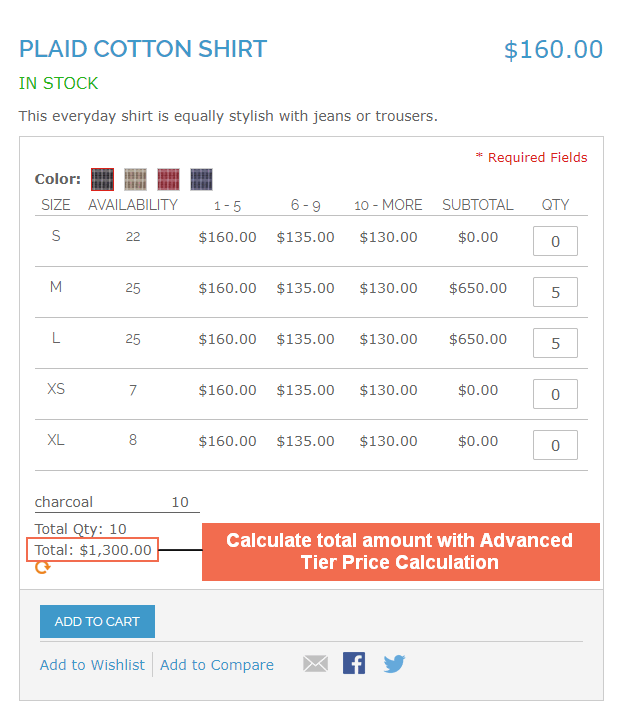 Customer would have to go to the Simple Product detail page for each size to view the tier prices. A lot of clicking for customer and easy to lose sale. Customer sees view the Configuarable Item (The Frame) and now can see all of the different sizes and tier prices for each in one table. They can add any or all to the cart right there. 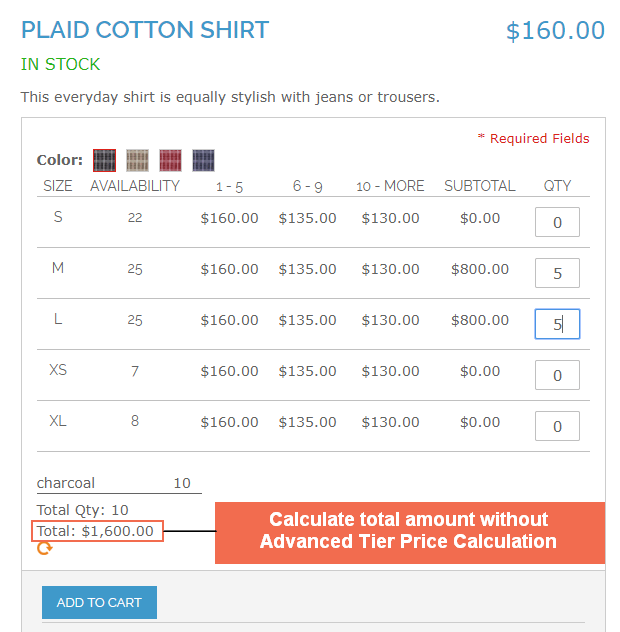 Extension shows you a running tally so customer can see $$$ of whole order if they are adding different sizes and quantities before adding to cart. BSS was very responsive. It was like they had an office next door. I would definitely recommend this extension and this company. The money spent on this module is money spent well. Without this module I could never have realized the project that a very demanding customer asked me. You can also have a very helpful and competent assistance. This extension is great. It absolutely deserves to be the best extension for configurable product. I really satisfy with its performance! I decided to buy this extension because I found what I need in the description. And luckily, it does exactly what it said. Normally extensions that support viewing configurable product like this do not have the color swatch function. But this one is different ! It allow me to enable the color swatch function, which is very helpful for my furniture business selling. I am extremely satisfied with this extension. It brings me a lot of convenience in product management. Since I installed Configurable Tab Table View for my Magento store, conversion rate has been increasing because customers find it easier when selecting products than before.